Yes, this post is more than a few days behind schedule, but better late than never, right? Below I have listed some goals that I would like to work towards in 2014. I'm sure this is the millionth post about resolutions that you have read and it's probably more boring than a baseball game (sorry baseball fans, I'm just not into it), but I like to blog about my goals and then look at them throughout the year to stay on track. I bought a new camera and need to put it to use. Maybe Melissa and I can get together more often and take photos of our finished sewing projects. I should also get outside and photograph the beautiful areas around my house. Hobbies should be fun and I don't want to stress myself out. My goal is to have fun making things that I will wear and not focus on a list of things that I "need" to learn. I have my whole life to sew and I don't need to get anxiety over deadlines and make sewing feel like homework. I'm not sure how to go about this, but I would love to have an online book club with you guys. Something casual every two or three months or so. Is anyone interested? My husband is great and if anyone deserves something handmade it's him. I ordered all three Thread Theory patterns and plan to make them for him. I am not looking forward to making adjustments for his muscles, so maybe I should hide his protein shakes and discourage him from going to the gym in the meantime? hahah! Just kidding! There is so much pressure to blog and sometimes I force myself to put up a post even though I'm not 100% feelin' it. I doubt that any of you are lying awake at night wondering why I haven't posted as much, so I shouldn't stress about blogging when I'm not in the mood. And if you are lying awake at night thinking about that then I am kinda creeped out right now. I used to sew a lot of dresses, but they don't get worn as often as they should. If you follow me on Instagram then you have seen the many tops I have made, but not blogged. I haven't posted them online because I have this fear that you guys won't think it's "exciting," but I need to get over it because that's what I wear. I don't wear fancy clothes all the time and who cares?!?!? Continue to learn and make things that I will use and wear. In conclusion, this year I want to have fun making things that are functional! Great goals! I'm in the same boat as you considering the blog more but only if I want to. If you're interested: Elsie and Emma from A Beautiful Mess have started a book club... Maybe you can join them? good goals! i think with something like a sewing blog, there's not that pressure you see in articles about blogging to post x times a week or on certain days or whatever. people know that if you don't post, you maybe don't have a finished garment to share. i'd rather read less posts than "scheduled" posts IYSWIM? also we like sewing - it might not be massively exciting but it might be inspiring or useful? I would love to see your everyday items blogged. I'm quite the jeans & t-shirts kind of girl with a handful of cardigans thrown in & the VERY occasional a-line skirt or dress. It would be great to hear more about sewing knits since I have never been brave enough to try, but that's about 90% of what I wear. Awesome goals!! And I would love to see the tops you made blogged. It inspires me to make the tops I need and don't' want to sew because I just don't feel motivated enough too. The book club sounds cool. I really need to read more. We have a book fair at the hospital I work at and I'm always buying books but I never read them or I never finish them! ugh. Sounds wonderful! The book club sounds good to, Happy belated New Year! You should blog when and what you want! I honestly believe that the more authentic you are to yourself, the more fun you'll have - and we'll all gain a lot more from that energy than from anyone who posts pretty dresses that will never be worn just because they think that's what everyone wants. I'm excited to see what 2014 will bring for you! Yay! Dude, I totally agree with Amy-- blog when and what you want! I know the pressure, though. I start feeling weird and guilty when I haven't had time to blog (which piles on feeling guilty for not having the apartment clean enough, not calling my mom enough, and all the other things that start to fall by the wayside when I'm really busy). But we all love to see the stuff you're excited about-- keep sewing and posting what you want to! Not that you need my approval, but I think those goals are awesome. 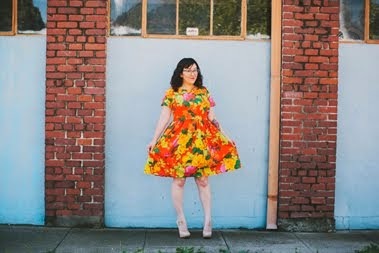 Don't be afraid of posting everyday garments: I WANT to learn more about them because I, for one, would like to make more also! I like posts about party dresses and fancy coats, but basic pieces should get more blog love too, really. Your goals sound great :) I think we can all join in the "make more items I will wear everyday" goal. And don't worry about your blogging frequency! I'm always happy to read your posts, but I wouldn't accost you for not posting oftener. Also, what is the name of that fantastic sewing themed fabric up there in your picture?! Yes, plz: book club & Thread Theory patterns! Librarian here: Book club? I am so down. A book club is a FABULOUS idea (you always read the coolest books!) and I would totally get in on that. Great goals! I still have yet to blog about my 2014 goals, so you're not the latest one, BTW. I'm very much interested in some more sewing-project photo shoots! Right now I don't have anything to photograph (except a Hawthorn top that turned out too tight, so that'll have to wait until I lose some weight ha ha). I have Monday off so I'm hoping to start something new then. And I like the idea of the book club too, I'm just afraid I might end up being flaky about reading once I start my classes. Please blog your tops! I am always interested in cake too, not just the icing. Great goals. Achievable and inspiring. This is such a great post! 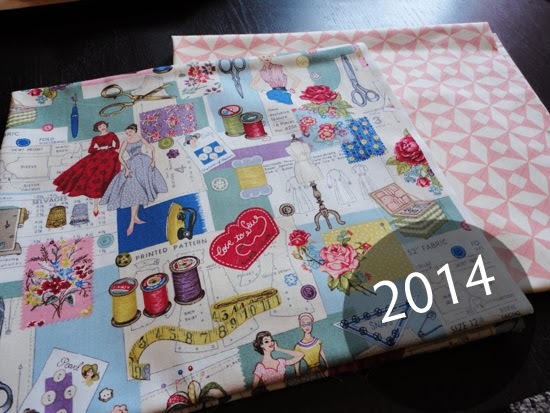 Nearly all of your goals parallel things I want for my sewing in 2014. Especially what you say about blogging more, but only if you feel like it. I am so new to blogging and I always feel a bit self conscious about it. I also love your idea for number 2 with an online book club. I'd definitely participate. And as for exciting, I think the presentation and story about the process is much more important than how "exciting" the make might be. My work situation is so casual that my dresses also hardly ever get worn. I'm with you 100% on making everyday pieces! Can't wait to see what 2014 brings for you! A wonderful list of goals. Only just found your blog .... It's great! Count me in for any online book club too.